Chris “Elio House” Eliopoulos Talks Yo Gabba Gabba! 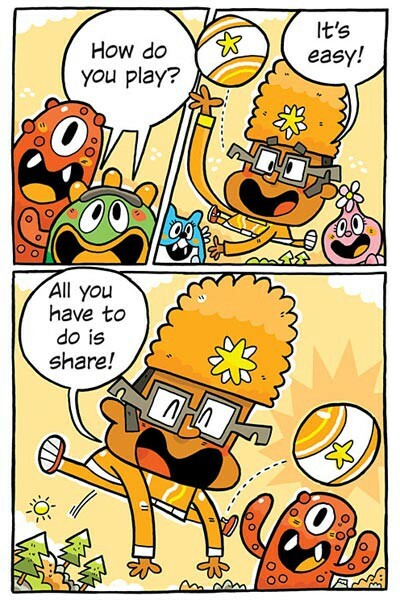 How could we have a Kids Comics Month without somehow involving one of the most popular kids shows out there today, Yo Gabba Gabba? Fortunately, we had the chance to speak with Yo Gabba Gabba art director Chris “Elio House” Eliopoulos about his new board book from Oni Press, Yo Gabba Gabba: Gabba Ball! He talks to us about what he thinks makes kids engage in reading and entertainment, as well about his upcoming book from Top Shelf, Okie Dokie Donuts! TFAW.com: Although Yo Gabba Gabba started out as a kids show, it’s got a huge fan base of parents and teenagers now. What is it about the show that appeals to all ages? Chris Eliopoulos: Its appeal is it’s a genuinely fun show. It’s also rich with influences that entertained us as kids (and still today!) Japanese monsters, skateboarding, and 8-bit video games just to name a few. It’s fun for nostalgic adults to share these things with kids. Having some of the hottest musical acts drop in to sing songs helps too! TFAW.com: Yo Gabba Gabba is such an uncynical, innocent, fun show–something that’s rare these days, even among kids shows. What can you tell us about the philosophy behind the show? CE: The people who make the show have a lot of fun making it. That energy is definitely infectious. A philosophy I’ve noticed is to keep things fresh and don’t worry about being silly. 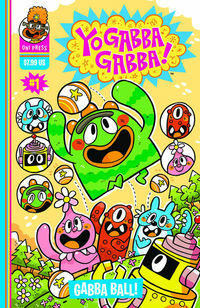 TFAW.com: Why did Yo Gabba Gabba decide to partner with Oni Press for your board books, instead of a traditional kids’ book publisher? CE: Oni Press is one of the best games in town. YGG knew Oni wouldn’t have any trouble producing great comics. (They do it year round!) It was a natural fit, like peanut butter and jelly. TFAW.com: How did you come up with the concept for Yo Gabba Gabba: Gabba Ball? CE: When I was thinking of a story for the comic book, I wanted to include everyone’s favorite character (so no one would get jealous!) I also wanted to make sure everyone had an equal part. So I thought what better way to do that then have them all play a sharing game! 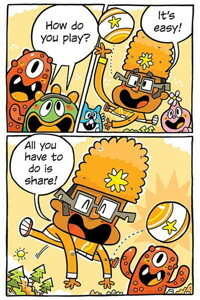 TFAW.com: Yo Gabba Gabba: Gabba Ball is definitely all about sharing! Do you think it’s important for kids books and shows to feature morals or lessons? Why? CE: I think kids books should be fun first. Morals and lessons are fine, but they should take the back seat. Children don’t like being preached to. If they enjoy the story, the lessons and all the good stuff will come out naturally. TFAW.com: Are you a comic book fan? If so, which books do you follow? CE: I love comic books. I love all sorts of titles and types. I think of the comic book store as one big dessert buffet. I make sure to read a little bit of everything! 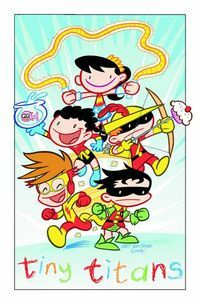 TFAW.com: You also have a new kids comics series coming out from Top Shelf: Okie Dokie Donuts. What can you tell us about it? TFAW.com: What do you think are the best titles for kids today? CE: If a book keeps a kid into reading, then I think it’s one of the best. TFAW.com: What do you think kids best respond to in entertainment? CE: Kids respond best to anything that has an opportunity to share a sentimental experience. There are a million books out there, but chances are the one they like the best is the one you personally read to them over and over. The TV shows they enjoy the most are probably the ones the whole family laughs at. The video game they like the most is the one they beat you in every night. TFAW.com: What else do you have coming up? 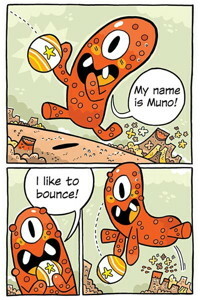 CE: I have another comic book coming out next May called Monster Party, another all-ages comic book being published by Koyama Press. 2010 was really great and I got a chance to work with a lot of new folks! I’m super excited because I have a feeling [that in] 2011, things will just keep getting better! Thanks again to Chris for taking time out of his busy schedule to chat with us. And thank you, dear readers, for participating in Kids Comics Month! 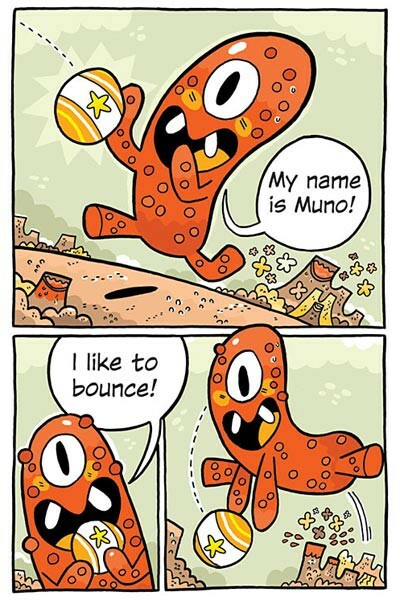 If you haven’t yet, take a peek at our kids comics page–you’ll find hundreds of all-ages comics that are great for the younger readers you know. Are you a big fan of Yo Gabba Gabba? What do you like best about the show? Post your comments below! Boom! Studios and crew have knocked it out of the park again. 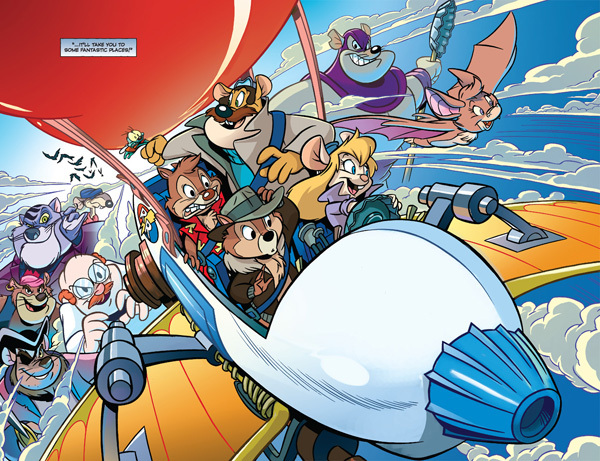 This time, Ian Brill and Leonel Castellani bring back Chip ‘N’ Dale Rescue Rangers! Although only one issue has been released, we’re eagerly looking forward to what’s in store. 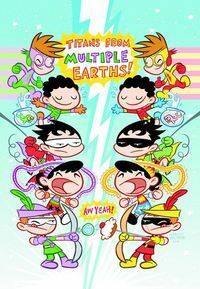 To that end, as part of Kids Comics Month, we interviewed Ian Brill and Leonel Castellani! TFAW.com: How did you become involved with Chip ‘N’ Dale Rescue Rangers? Ian Brill: Because of my work on Darkwing Duck, Boom! 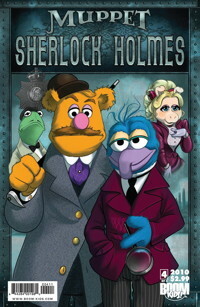 asked me to write another title starring characters from the Disney Afternoon. So now I get to create the current adventures of both Darkwing and the Rescue Rangers, a task I take quite seriously and am having a lot of fun with! Leonel Castellani: Some time ago a Boom! Assistant Editor contacted me to work on a Toy Story project that I couldn’t accept due to other work commitments, but he was cool enough to keep me in mind and offer me the Rescue Rangers project some time later. I’m super glad he did because I’m having a great time working with these characters. TFAW.com: Has series creator Tad Stones, been involved with the new comic book series, or have you pretty much run with it? Brill: I come up with the situations and write the scripts. Tad is a friend and I have talked to him about these characters, his insights are extremely helpful. TFAW.com: You’ve already done a great job of getting us reacquainted with Gadget, Monterey Jack, and Zipper in issue #1. Was that decision because you felt your audience already knew Chip and Dale well enough to get the series started? Brill: Writing issue #1 I tried to give everyone a piece of the spotlight. Plus we included a Who’s Who of the cast in the beginning of the book, giving me more room to tell our story. 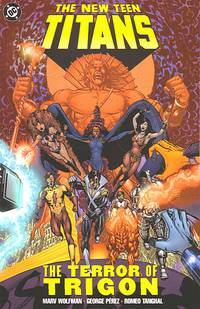 I think we hit the perfect balance of reintroducing these characters and giving them a new story. TFAW.com: Can you tell us a bit more about the first arc, “Worldwide Rescue”? Brill: Something from both Gadget and Monterey Jack’s past is being misused by an arch-villain. It’s a global event that takes the team to various locales, each of them a new challenge. TFAW.com: What’s been the most rewarding part of bringing these characters back into action? Brill: Capturing the voices, these fantastic personalities. These are great characters that are so versatile, and I love thinking about where to take them. Castellani: Getting the chance to work with such great characters and awesome scripts by Ian is simply amazing. I’m having a lot of fun drawing these little guys, and it’s very special to see the reaction of the fans everywhere. I’ve received many emails from fans that are super excited to see their beloved characters back in action. Some of them are especially thankful for getting the chance to introduce these characters to their kids. That’s pretty amazing. TFAW.com: What’s been the most difficult part? Brill: I work hard to make sure that every character is given their due, plus that the threat they’re up against is made clear. It’s important to me these are clearly told, entertaining stories that feature many elements that all generations an enjoy. Brill: I like them all, but Dale and Monterey Jack can be the most all-out fun because because they are always moving forward, blustering into situations. Castellani: To be honest, I don’t really have a favorite. I just try to concentrate on the acting and reactions of the characters to every situation, and above all things, try to tell the story as clearly as possible. But it’s super fun to draw all of them. However, I must say there’s something in this particular storyline related to Monterey Jack, and the way he’s beginning to see the world in a different perspective, that makes him very interesting to draw. TFAW.com: The world of RR seems much larger than ours, with virtually endless possibilities for adventures. What are you excited to show us in the coming months? Brill: I’ve been thinking a lot about what happens when other critters in this world step up and be as ostentatious as the Rescue Rangers, whether they be heroes or villains. How do the Rescue Rangers deal with other parties who really want to carve out their own piece of the little but also giant world? Castellani: Fun and adventure in every way possible. TFAW.com: Leonel’s art is absolutely knock-out. The facial expressions are spot-on and the characters really feel alive. What’s it like working with such a talented artist? Brill: Leonel is fantastic. I’m confident when I turn in a script that he will get the big adventurous parts down, as well as all the emotions the characters get express. He attends to all these aspects of the story. It’s a joy to see these stories come alive with his work, as well as the work of colorist Jake Myler and letterer Jason Arthur. 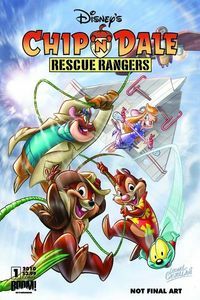 TFAW.com: What role do you see comic books like Chip ‘N’ Dale Rescue Rangers, playing in childhood literacy and fostering a love of reading? Brill: I hope these get kids to enjoy both graphic literature as well as the entire spectrum of the written word. I know comics played a major part in my reading experience, leading me to spend a lot of time in the library discovering both comics and prose. I can only hope I pass that on to a new generation. Castellani: I think it’s very important to encourage children to read, and comic books are an excellent (and sadly underrated) way to introduce them into the world of literature. I think all-ages comic books play an extremely important part in the formation of young readers. TFAW.com: What other all-ages books are you reading right now? Brill: With regret I have to admit I barely have time to read new comics. I do revisit Carl Barks’ Uncle Scrooge stories and Jeff Smith’s Bone, which are two brightly shining guiding lights for me. Castellani: Actually, I’m not following any comic series right now. I did receive a few TPB’s of some awesome comics that I haven’t read before and found great. Mike Kunkel’s Hero Bear and The Kid is great, for instance. My friend Todd Dezago sent me the first Pehapanauts TPB and I enjoyed that one a lot. And of course, I’m always coming back to my old collection to re-read the classics like Asterix by Goscinni and Uderzo, Spirou by André Franquin. TFAW.com: Do you have any other upcoming projects you’re working on? Brill: I’m cooking up a lot of new ideas for both Rescue Rangers and Darkwing, I hope people enjoy them! Castellani: I’m developing an all-ages adventure graphic novel to hopefully be released sometime next year. And that’s all I can say about that. Thanks again for you time, gents. It’s been a fun interview! It’s not too late to jump into Chip ‘n’ Dale Rescue Rangers! Jump aboard and get in on all the action! Fond memories of the Disney Afternoon shows? Was Rescue Rangers one of your favorites? What did you think of the first issue? Let us know below. 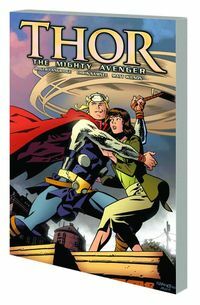 One of my favorite new comic book series of 2010 has been Thor: The Mighty Avenger, by Roger Langridge and Chris Samnee. It is extremely difficult to take a character with decades of history and continuity and “re-boot” it in a way that’s A.) accessible and appealing to new readers and B.) doesn’t inspire nerd rage in longtime comic book fans. 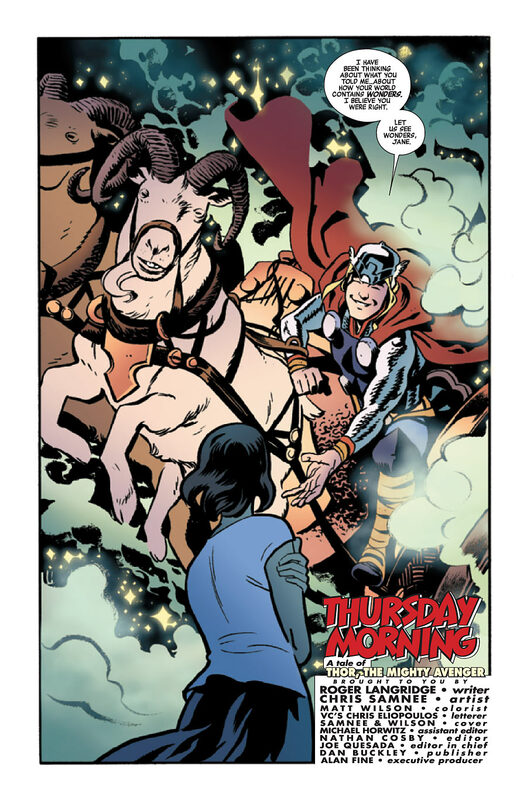 Thor: The Mighty Avenger has been a huge success on both fronts, and although it’s not technically an “All-Ages” comic (it’s rated “A”: appropriate for age 9 and up), it’s an excellent addition to Kids Comics Month. Depicting a more human-sized Thor who has been banished to Earth to find redemption, Thor: The Mighty Avenger has been having a blast depicting Thor’s romance with Jane Foster, his camaraderie with the Warriors Three, a hilarious battle with Captain Britain, plus robots, sea monsters, Namor, and much more. 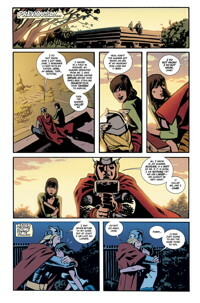 Samnee’s incredibly expressive, fun artwork has perfectly complemented Langridge’s deft writing. Unfortunately, one area Thor: The Mighty Avenger has not been a huge success is in sales: while issue #1 debuted with about 20,000 copies sold, sales eventually dipped below 10,000, and the series ends in January with issue #8. This has prompted an online campaign to save the book, so who knows? 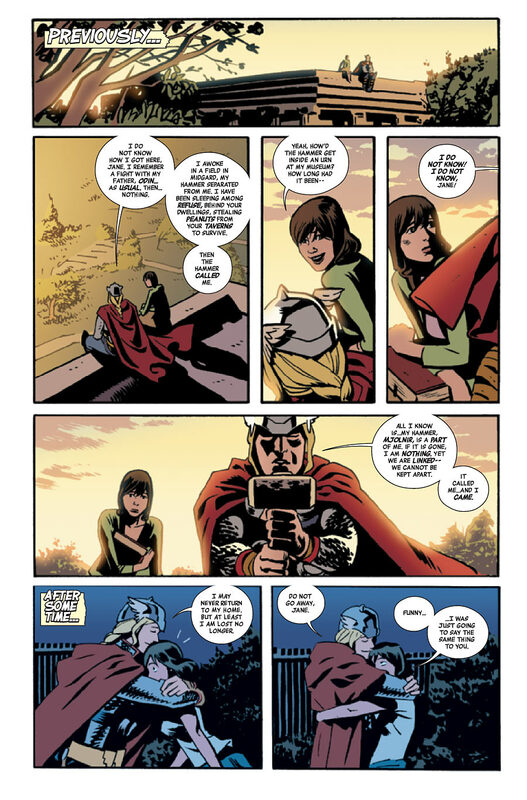 You should probably order Thor: The Mighty Avenger Vol. 01 The God Who Fell to Earth to be on the safe side. TFAW.com: Hi Chris, thanks for “chatting” with us today! First, I wanted to tell you how much I’ve been loving Thor: The Mighty Avenger. It has been delightful, and it’s inspired such an enthusiastic fan response. Did you have any idea how beloved the book would be? Chris Samnee: Thanks so much. It’s my pleasure. As for feedback I really had no idea what the response to the book was going to be like. Upon reading the first outline that Roger Langridge had put together I knew it would be a new fresh take and that it looked like it was going to be a ton of fun for me to work on. I was just keeping my fingers crossed that readers would like it as much as I did. TFAW.com: Had you been a fan of Thor previously? What kind of research did you do before you started the book? CS: I had read plenty of Thor and Avengers comics growing up and was familiar with the character, but for some reason he never really spoke to me. After being offered the job on Thor: TMA I picked up the Marvel: Essential volumes of Thor by Stan Lee and Jack Kirby and started at the very beginning. Reading those early adventures gave me a much better idea of what Thor’s character really is, without all of the baggage he seems to have amassed over the years. TFAW.com: Thor has had so many incarnations over the years and years–and years! How did you create his look for this series? CS: Thor’s look in Thor: TMA is sort of a cross between Kirby’s classic interpretation of Thor, Coipel’s Thor, movie Thor and a healthy dose of what I think would look neat on him. The original editor of the book, Nate Cosby, had given me a few hints at what the movie’s incarnation of Thor would be and asked if I could give Thor the metal sleeves. Beyond that Roger and I fought for the blue pants. They seem to bring his look back a bit closer to the Silver Age version. TFAW.com: Even though Thor is many eons old compared to a human, he’s relatively young in Asgardian years–and he looks it in the book. He’s a much more human-sized Thor here; sometimes he has his godly moments, and sometimes he looks like a kid playing dress up. Was that intentional? CS: Well, I wanted this incarnation of Thor to be a bit more relatable, a bit more down to Earth. According to editor Nate Cosby, he’s closer in power level to the Superman seen in the Fleisher Studios cartoon from the ’40s. Beyond that–as he was banished to Midgard–he was stripped of Mjonlir and de-powered. A slighter build on Thor for this story works as a bit of a shorthand for that. TFAW.com: What’s it been like, working with writer Roger Langridge? It’s time to play the music! It’s time to light the lights! It’s time to meet Amy Mebberson from The Muppet Show tonight! Erm . . . err . . . excuse me! I get very excited talking about Boom! 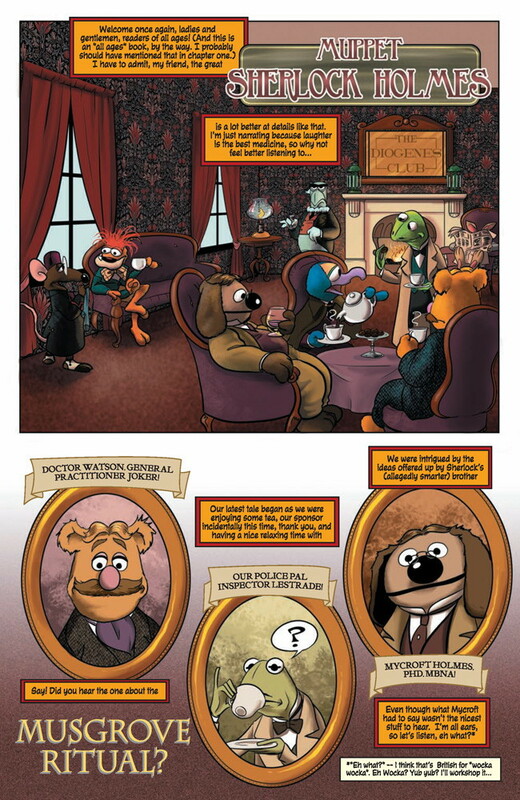 Studios’ Muppet Show comics, and I couldn’t have been more pleased to interview artist Amy Mebberson for Kids Comics Month! Read on to learn about her favorite characters (she helped bring back Skeeter!) and why she loves the Muppets so much. TFAW.com: Hi Amy, thanks for “meeting” with us for the interview! So what’s your “origin story”–how did you break into comics? Amy Mebberson: I’ve drawn comics for fun almost my entire life, but I didn’t start doing them professionally until 2006. I was lucky in that I got to segue quite smoothly into comics from my former career in animation at Walt Disney Animation Australia. Our studio was shut down in the great 2D purge, and I was fortunate to win a spot in Tokyopop’s Rising Stars of Manga contest in 2005. That resulted in being approached to do a graphic novel series with writer T Campbell. So basically as soon as Disney Sydney closed down, I sat down at my desk at home and started creating Divalicious! with Campbell, which ran to two volumes. TFAW.com: What’s it like moving from animation to drawing comics? What particular advantages/disadvantages does that pose? AM: Well, certain aspects of the animation process certainly have a lot in common with sequential comic art. Storyboarding is, in my opinion, an obvious cousin to comics. I think working in animation helps with comics because when doing traditional drawn animation, you have to have a really solid grasp on how people, animals and objects are constructed and work from all angles. If an animation character is not logically well-constructed and drawn, it will not move or act convincingly. As for disadvantages, well as a former character animation artist, the learning curve can be a little steep jumping from just drawing characters to drawing full sets, props and effects as well. The premium posed by limited page space means that many times I can’t draw detailed character acting because there just isn’t room to draw multiple nuanced panels. It’s often necessary to pare down a character’s pose to just one which best conveys multiple emotions in the few lines of dialogue they might have in that panel. TFAW.com: What do you like best about drawing kids comics? AM: Doing comics directly targeted at kids was never really an intentional goal of mine. I consider Disney comics to be universally appealing, not just something for kids. So I don’t really consider myself a “kids” comic artist, even though that’s what most of my titles are branded under. I draw all-ages comics that appeal to me personally and I love cartoons. I kept watching cartoons long after I left childhood–a great source of consternation to my mother, who thought there might be something wrong with me! Paul Tobin Tells All About Spider-Girl & Marvel Adventures! As part of Kids Comics Month in December, we’ve been able to do some pretty cool interviews, including one with Spider-Girl and Marvel Adventures writer Paul Tobin! Sit down and relax as Tobin tells us about the evolution of Spider-Girl, why he loves writing kids comics, and more. Plus, learn how to create a kids comics subscription and save 20% at TFAW! TFAW.com: Hi Paul, thanks for “chatting” with us today! After years of publishing comics for an older audience, Marvel and other publishers seem to be trying to create more comics specifically for kids. What do you think kids want to see in their comics? Paul Tobin: Honestly, I don’t think it’s any different than what adults want to see: engaging and well-thought out characters, a storyline with action and depth. A sense of adventure . . . that anything can happen. I think a clear division of all-ages / adults comics is what hurt the all-ages market in the first place. TFAW.com: What do you like best about writing all-ages comics? PT: The freedom of being able to completely world-build. The all-ages material isn’t as bound by the Code of Continuity, so if I feel like bringing in some disparate elements, it’s all up to me. 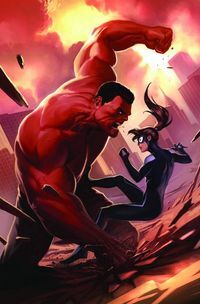 TFAW.com: I wanted to say how much I enjoyed Spider-Girl #1. How much input did you have in developing the character and her storyline? PT: Pretty much 100%. I was given the character, and beyond that I was able to go wild. 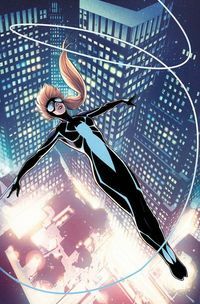 It’s such a fresh start for Anya Corazon that no matter which way I wanted to jump, then-editor Nate Cosby just got out of the way. Nate has left Marvel now, and the rumor at least is that he’s amassing an army of bulldogs for some sort of world dominion quest, but until he takes over the world, my current editor Tom Brennan is taking a similar stance of trusting me to do what’s right for the story and the character. TFAW.com: The @The_Spider_Girl tweets in the comic are an interesting touch aimed at tech-savvy younger readers. You are the man behind the actual Twitter profile too, right? When and why did you decide to do that? PT: I run the Twitter, but Colleen Coover does help me from time to time when I’m avalanched by deadlines. As far as why I do it, I’ve written some 150 books for Marvel at this point, and pretty much every time I’ve had more story to tell when I run up against the 22-page wall. So, I’ve been thinking of ways to expand the storytelling . . . work in some more characterization, give the reader more of a feel for the characters. The expansion of Twitter allows me to do that. It’s an experiment that’s been working very well. TFAW.com: Is this the first time there’s been an official, in-continuity Twitter feed connected to a comic book? Do you see this continuing indefinitely? TFAW.com: Spider-Girl is an all-ages comic that can really be enjoyed by readers of any age–much like Thor: The Mighty Avenger. How do you create that balance when you write? PT: I write every story so that it appeals to me, actually. If I’m having fun writing a story, if I feel there’s characterization and action that’s exciting and thought-provoking, then it can work for any book, whether it’s all-ages or not. Writing the Adventures line, I don’t have murders, or sexual situations, but I certainly don’t gauge the stories for younger audiences . . . I just make them accessible. Most of the books that I read when I was a kid were what we’d consider as mature stories today, and I enjoyed them immensely . . . so I suppose in some way I’m also writing for the young Paul Tobin, as well as the bald version in today’s world. TFAW.com: Unlike past Spider-Girls, Anya Corazon doesn’t have any powers (she lost her powers after The Grim Hunt). What are the challenges/benefits to having a superhero without any “super” powers? Scott Gross Talks Scooby Doo and Looney Tunes Too! Two of the most recognizable kids comics today are DC Comics’ Scooby Doo, Where Are You? and Looney Tunes books! Based on the beloved cartoons, these series detail the continuing adventures of Scooby and the gang, and Bugs Bunny, Tweety Bird, and more. They’re an excellent choice for younger readers who might be resistant to reading–who can say no to these classic characters? As part of Kids Comics Month, we got to chat with writer/artist Scott Gross, who tells us how he got into comics as a kid and what’s coming up for the Mystery Gang! TFAW.com: Hi Scott, thanks for taking some time to talk with us! Scott Gross: My pleasure–very excited! TFAW.com: What’s your personal history with comics? Did you read them as a kid? SG: I think the first comic I ever actually read was the Marvel Secret Wars series in 1984/’85–I was 9. With most comics I ignored the stories and just devoured the pictures, copying the characters and their poses. How to Draw Comics the Marvel Way was a big influence early on. TFAW.com: Did you start writing comics or drawing them first? SG: Probably drawing, picturing my internal monologues or things I was daydreaming about. I would just draw to myself and never even write in the word bubbles. Same as today, really. TFAW.com: What draws you to work in kids comics? SG: You need a niche to fit into the industry. Everybody else was competing to draw Batman, like that’s so great. My tastes run towards comedy anyway, so I decided to try the “humor” books–which are aimed at kids. It’s the only place you can at least attempt to be funny and work in comics today. There’s no comedy in Batman, but there can be in a good Looney Tunes story. And it’s satisfying artistically because I get to emulate the work of some true design geniuses–Chuck Jones, Maurice Noble, and Iwao Takamoto, to name a few. TFAW.com: Did you watch the original cartoons of the properties you’ve worked on as a kid? SG: Of course! Looney Tunes and Scooby Doo?! That’s meat-and-potatoes where I come from. TFAW.com: You’ve been doing some incredible Looney Tunes covers. What’s it like drawing these iconic characters for a new audience? SG: The great thing about LT is that for any cover assignment, there is something in the long, grand history of the cartoon shorts that you can refer to for inspiration. Even if it’s just a color scheme–all you need to do is go back and watch the classic cartoons, and it’s all right there. TFAW.com: Do you have a favorite Looney Tunes character to draw? SG: They’re all difficult. Any young artist should take solace–they’re hard for me too. I would say my current favorite is Eggbert Jr.–the little yellow chick bookworm genius who Foghorn is always trying to teach a lesson to. 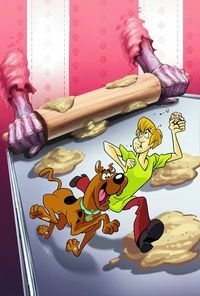 TFAW.com: With Scooby Doo, you’ve been writing as well. How did that come about? SG: Once I proved myself as an artist I started emailing my editor pitches with different story ideas, each about a paragraph in length. Some got approved and I wrote them up as 10-page scripts. From then on I was writing the stories too. TFAW.com: What do you focus on with your stories? How to Create a Kids Comics Subscription & Save 20%! You love comics–but are you doing your part to nurture the comics fans of tomorrow? One easy way to do so is to create a kids comics gift subscription for one of the younger readers in your life. Not only will they benefit from a monthly dose of awesome comics, but you’ll save 20% off the cover price! You can discontinue it at any time. Plus, instead of paying all at once, your credit card is only charged when comics are shipped! Here’s how to begin: first, ask yourself if you want the comics delivered to you, or to a separate address. If you’re shipping it to another address than your regular pre-order address, you will need to set up a separate account and add the recipient’s address as the shipping address. Next, ask yourself how often you want the comics to arrive. If you’d prefer to save on shipping, you can set your pre-order shipping frequency to every four weeks, but if you want each comic to ship as it arrives, you can set your shipping schedule to weekly or every two weeks instead. Note: your first order will ship as soon as it becomes available; subsequent orders will ship according to your stated preferences. All set? Okay! Now log in to your account and head to our Subscriptions page. You’ll see Worksheet 1 at the top, with a list of ongoing monthly series you can subscribe to as Series Subscriptions. As you can see, I’ve added Archie & Friends and Chip N Dale Rescue Rangers. NOTE: a Series Subscription will subscribe you to comics only–if you wish to subscribe to graphic novels, I’ll show you how below. As you can see, our subscription service starts with the newest comics that have been solicited. If you wish to purchase any previous issues, you must order them manually. Future issues will be automatically ordered for you when they become available. Here, you can make adjustments to that month’s shipment only–to make permanent changes to your subscriptions, click the “Clear This Entry” radio button (see figure 1, above) and start over. From this point forward, you will receive monthly emails showing you which comics will be ordered on your behalf. You will be able to change your order before it becomes final, if you wish. 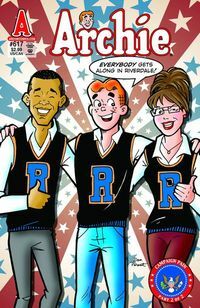 Again, future Archie graphic novels that meet your search parameters will automatically be ordered for you. To keep tabs on your subscriptions, make sure to check your email: at the beginning of the month, you will receive an email showing the list of products we will be ordering on your behalf, and you can change your order however you see fit. You will also receive a reminder email near the end of the month. At that point, you will still have a few days to modify your subscription items before we finalize your order. A few days later, we will commit your order and send it on to our distributor. At this point, your order is considered firm and is not refundable. You can cancel your subscriptions at any time, but keep in mind that this will not automatically cancel any items that have already been ordered for you by our system. Contact Customer Service if you have any questions. Keep in mind: sometimes, subscribing to comics on our site can get confusing. If you run into any issues, please click the “Live Chat” button at the top of virtually any page on our site (except the blog) between 9 a.m. and 5 p.m. PST Monday-Friday and our talented customer service representatives can help. Are you planning on buying kids comics subscriptions as gifts this holiday season? Add your comments below!